Laura Piras BA (Hons) MMus MA specialises in the performance of 17th, 18th & 19th century works on historical flutes. She has performed with The Hanover Band, the London Handel Orchestra, Southern Sinfonia, Arcangelo, Meridian Sinfonia, the Orchestra of the Age of Enlightenment, La Nuova Musica, Armonico Consort, The Parley of Instruments, Little Baroque Company, Musicians of London, and the Pythagoras Ensemble, for who she is Historical Performance Curator, in venues such as Buckingham Palace, the Southbank, St John’s, Smith Square, Cadogan Hall, Wigmore Hall, and abroad. Keen to share her experiences, Laura has worked with The Hanover Band and the Orchestra of the Age of Enlightenment on education projects. 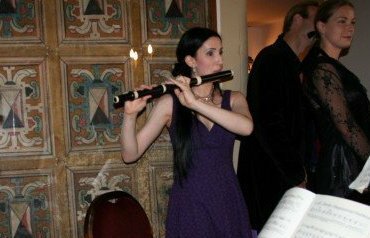 She currently teaches flute and music theory at Graveney School in London, and has many private students of modern and historical flutes. Previous teaching experience includes a post as modern and baroque flute teacher for the University of East Anglia from 2007-11. Laura received a MA in Historical Performance from the Royal Academy of Music, where she studied baroque and classical flutes with Lisa Beznosiuk and Rachel Brown, supported by the Winifred Disney Award. She won the prestigious Nancy Nuttall Early Music Prize and graduated with Distinction. Before specialising in historical performance Laura read music at the University of East Anglia, receiving a BA (Hons) and a MMus in Performance Studies. She was awarded four major scholarships for performance studies from the School of Music (Hilda Houssart, Britten-Pears, Imogen Holst and Frank Thistlethwaite scholarships) which enabled her to receive modern and baroque flute lessons from William Sleath. On graduating she was awarded the Dorothea and Rowan Hare Young Musicians Concert, a prize awarded to one UEA music graduate per year.